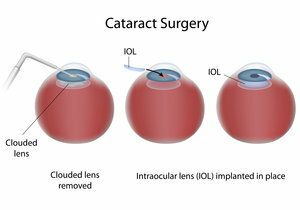 The only way to correct the clouded vision caused by advanced cataracts is surgical intervention. If you find yourself pursuing cataract surgery to remove one or both cataract-disease lenses, you may be wondering what surgical approaches are available for treatment. Although eye surgeons have successfully removed cataracts using manual surgical techniques for decades, new laser techniques give them more control over this delicate procedure. Both traditional and laser cataract surgery involve removing the natural cataractous lens and replacing it with an artificial lens. The traditional approach involves making a tiny incision in the eye with a manual surgical device. 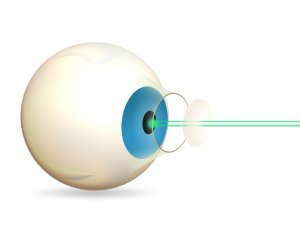 In laser cataract surgery, a femtosecond laser is used to make the incision instead. The ophthalmologist also uses a laser to break up the cataract-diseased lens before removing it, instead of using ultrasonic energy to perform this step. By replacing the manual steps in the procedure with the use of a laser, the ophthalmologist is able to provide an added level of precision during treatment and minimize any risks associated with the manual actions. While human eyes are similar, each is slightly different in terms of depth, size and the curve of the cornea. Laser surgery techniques take advantage of advanced technology to precisely map your eyes. This information is then used to calibrate the laser used during some surgical procedures, allowing extremely precise treatment. The laser’s precision speeds up both the surgery and the recovery time. Because the eye is less disturbed by the laser than with a mechanical blade, it may heal faster. Laser cataract surgery is still new, and study results have varied. Some studies have found the results to be comparable to traditional cataract surgery. Others conclude the superiority of the laser. A study published in a 2014 issue of Optometry Times found that the vision of the group treated with lasers was overwhelmingly better. The endothelial cell count on the cornea was also healthier after laser versus traditional cataract surgery. One drawback: The cost of laser cataract surgery is higher than the standard procedure. Talk to your insurance company to find out about your coverage level. 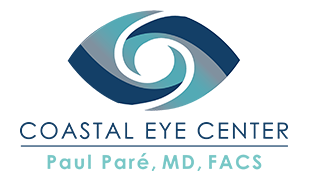 If you need cataract surgery and want to explore your treatment options, call us today so we can help.